Grilling with friends and family is a cherished summer tradition for many people, which is why July is celebrated as National Grilling Month. However, grills send thousands of people to the emergency room each year with burn related injuries. Flash burns. 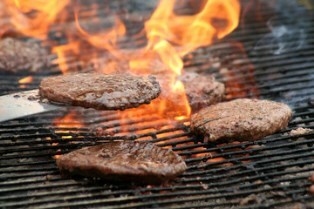 Flash burns to the face are one of the most common grilling injuries. Typically, this happens when grillers use briquettes and get impatient because the grill is taking too long to heat up. They overuse an accelerant like gasoline or kerosene, then the fire flares up toward the face. First- or second-degree burns are typical with this type of injury, but third-degree burns could also be a possibility. Singed hair and eyebrows are another common consequence. Burns when you’re intoxicated. Grilling and enjoying a few beers might seem like a harmless pastime, but alcohol and fire don't mix. Anyone who is intoxicated is prone to making careless mistakes while grilling. Slip and fall burns. Slip and fall burns can occur when someone slips and makes contact with a hot grill as he falls. This type of injury happens when there are children's toys or other clutter near the grill area. People can also be burned if the grill is near the pool and they slip on the surrounding wet surface. Burns to young children. Children can get burns from accidentally touching a hot grill. A lack of adult supervision is the most common cause of this type of injury, since children can't be expected to take proper safety precautions on their own. Children should be kept at least three feet from the grilling area at all times. Burns from poorly maintained equipment. Just like any other appliance, grills require regular maintenance. Leaving the grill greasy, failing to replace scratched or nicked connectors, or neglecting to tighten the hoses that connect the propane tank can cause injuries. When the grill is not in use, your LP tank valve should be turned off, and the tank should be stored upright in an area where the temperature won’t exceed 125° Fahrenheit. Burns from defective equipment. Occasionally, a defect in the grill itself can cause injury. Faulty burners, missing hoses, and flimsy heat shields are just a few of the problems that could result in burns even if the griller takes all appropriate safety precautions. The procedure for treating burns depends on the severity of the injury, but you should seek medical attention whenever you’re in doubt about your condition. A first-degree burn can generally be treated at home. Remove any clothing or jewelry around the area, then soak the burn in cool water for 15 to 20 minutes. Clean the wound gently with soap and water before covering with antibiotic ointment and sterile gauze. Use ibuprofen or naproxen to relieve the pain. If a burn is more than three inches in diameter or occurs on a child or an elderly person, seek medical attention as a precautionary measure. You should also see a doctor if you experience signs of infection such as a pus-like discharge or temperature above 100.4º F.
The first step in determining your eligibility for compensation is deciding who is liable for your injuries. If you were injured while attending a cookout at a friend's home, the homeowner may be held liable under premises liability if proper safety precautions weren't taken. However, if your injuries are related to a defect in the grill itself, you may have a product liability claim against the grill manufacturer. Personal injury claims can involve compensation for medical expenses, lost wages, and pain and suffering. However, these types of cases can involve complex liability issues and require a skilled advocate who can protect your interests. Neblett, Beard & Arsenault’s experienced legal team is committed to helping Louisiana residents who've been injured due to another's negligence receive the compensation they need to move forward with their lives. Please contact us online or call us directly at 318.588.6303 to schedule a free, no-obligation case review.